The Progressive Economics Forum » Is Harper right? Did corporate tax cuts really pay for themselves? Is Harper right? Did corporate tax cuts really pay for themselves? Posted by Toby Sanger under Conservative government, corporate income tax, corporate profits, taxation. No one seems to have questioned his statement, even though it was made on the same day Canada dropped to 15th place on the World Economic Forum’s index of global competitiveness from 9th in 2009. These rankings show corporate tax rates bearing little relationship to measures of global competitiveness. Harper’s statement puts him squarely in the company of the “Lafferites” and neo-conservatives who claim cuts to tax rates even at relatively low levels can pay for themselves by increasing economic activity and tax revenues. The “Laffer curve” charts the relationship between tax rates and revenues. A tax rate of zero will obviously generate zero revenues while a rate of 100% also won’t generate a lot of revenue either. Revenue-maximizing tax revenues are achieved at rates somewhere between these extremes. While all economists acknowledge this relationship exists, there’s a lot of disagreement about where the revenue maximizing rate and how steep the curves are. Progressive economists tend to agree revenue-maximizing tax rates are higher, while some neo-conservatives claim tax cuts even at low rates will increase revenues. Early advocates of these type of tax cuts argued that lower tax rates would increase economic activity and thereby revenues. However, there is little evidence changes in tax rates, except in more extreme cases, have a major impact on real economic activity. Advocates of tax cuts also argue that cutting taxes can generate increased revenues from income and tax shifting. Individuals and companies can shift their income between jurisdictions or between different forms of income to take advantage of lower tax rates. The Prime Minister indicated this is what he thought happening when he said Canada’s lower tax rate was attracting business, no doubt with the recently-announced takeover of Tim Horton’s and merger with Burger King on his mind. So is it true: have tax cuts actually led to higher revenues? Can we keep our Timbits and eat them too? 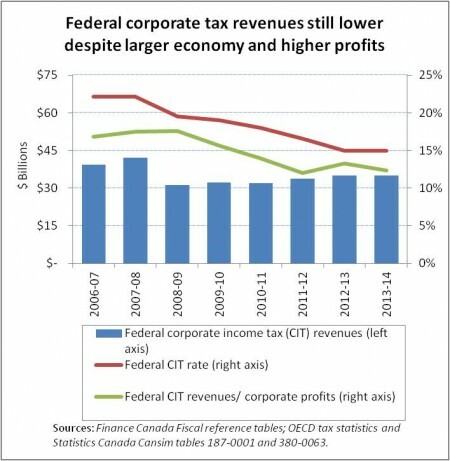 Contrary to what the Prime Minister said, federal corporate tax cuts have led to a significant fall in corporate tax revenues. As the table below shows federal corporate tax revenues rose to $35 billion in 2013/14, but this was still 17 percent below the $42.2 billion they were in 2007/8 when our economy and corporate profits were respectively 17 and 15 percent lower (in current dollars). In fact, as a share of our economy and of corporate profits, federal tax corporate tax revenues were 31 and 30 percent lower respectively last year than they were in 2007/8. That’s almost identical to the 32 percent cut in the federal corporate tax income rate from 22.1% in 2007 down to 15% from 2012 onwards (see chart and table below). Federal corporate tax revenues are expected to rise in coming years, but will remain well below the shares of corporate profits and the proportion of the economy they had been prior to these tax cuts. If federal corporate tax revenues were at the same share of the economy and corporate profits as they had been just before the Harper government’s cuts, the federal government would have approximately $15 billion more in revenues.Â If they were at the same 21 percent share of corporate profits as they had averaged in the two decades before these cuts, the federal government would have about $25 billion more in corporate tax revenues annually. With these additional revenues, the federal deficit would have been eliminated last year and we’d have more money to fund public services. As we have seen, there’s little credibility to the claim that corporate tax cuts are doing much to stimulate the economy with excess corporate cash at record levels and little growth in investment rates or the economy. It’s more likely that corporate tax cuts have led to some income and tax shifting from other tax jurisdictions (such as the Tim Horton’s deal) or from personal income, which is taxed at a higher rate. These may have lessened the fall in Canada’s corporate tax revenue losses, but not by much. Even worse, this tax shifting makes the overall net impact even more negative as any revenue gains from income shifting come at the expense of even greater revenue losses elsewhere and fuel a race to the bottom with tax cuts. Few would dispute that corporate tax cuts increase corporate profits, elevate executive compensation and probably boost short-term shareholder returns. But to claim they pay for themselves by increasing revenues? That’s pure fiction. And if corporations pay a lower share of taxes, that means the rest of us will pay more either through relatively higher taxes or cuts in funding for public services. As someone who has a masters in economics, Harper interprets economic data like someone without any knowledge of economics. Since our economy grows every year (unless it’s in a recession), nominal tax revenues are going to grow as well. That’s why economists measure tax revenues as a percentage of GDP. Harper is also a hypocrite. In his 2009 budget he says he will save corporations $15-billion a year in taxes with his tax cuts. BTW, when one compares our corporate tax revenues to other resourced-based economies they are very low. In 2011, ours were 3.1% GDP, Australia’s were 5.2% GDP and Norway’s were 10.7% GDP. Every percentage point was about $18 billion in 2011. 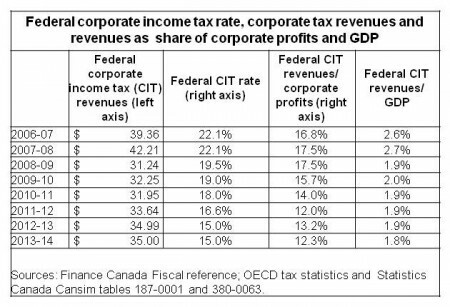 “Corporate income taxes are lowest in Canada (7.3 per cent effective corporate income tax rate), France (14.7 per cent), and China (14.8 per cent). “At the other end of the scale, effective corporate income taxes exceed 30 per cent in Japan (31.5 per cent), Brazil (36.1 per cent), and Italy (37.6 per cent). This corporate welfare is not translating into economic growth and jobs. It’s just giving wealthy shareholders and corporate executives free money at everyone else’s expense. Ron: good points & additional sources. While KPMG’s “Competitive Alternatives” report suggests Canada is more competitive because of our lower corporate tax rates, indices of competitiveness such as those produced by the World Economic Forum, show little or no relationship between corporate tax rates and competitiveness. Agreed. It’s a foolish to believe reckless corporate tax cuts will make a country competitive. That’s like throwing money at a problem. It takes the right investments to make a country really competitive. Making post-secondary education and worker training accessible. Investing in infrastructure, especially broadband internet and green technology. We are doing the opposite. Skimping on post-secondary education and infrastructure. And going “all in” on exporting resources to China (both Harper’s and Trudeau’s economic plan.) Tripling Alberta’s dirty-energy tar-sands development. This statement seems to suggest that tax revenues are needed to fund public services. But is that the case? as usual Jim an excellent bit of analysis, but for MR Harper whose mindset is, “my minds made up don’t confuse me with facts” it won’t mean much!! Canadians do not need a degree in economics to know that stagnation is based on failed banking policy. In 1974, the Bank of Canada was relegated to the sidelines in favour of the global “mafia”(now—Basel Committee 3) style of corporate controlled banking. This “insanity” has cost Canadians over 1 trillion dollars in compound interest payments since that juncture. Can’t do better than 0 percent interest with the Bank of Canada. When you add in the over-inflated Canadian “petroleum-dollar”, you immediately see a major drop in trade with our trading partners. Canadians are simply reduced to economic slaves by continuously filling the “piggy-bank” with hard-earned tax money. Global bankers who hold the purse strings of the Canadian economy and corporate “worshipers” of pure greed are the all-consuming pigs, fully endorsed by idiotic government policy. A full 60 billion dollars per year is handed to private bankers to service the national debt. This wasted money could be fully utilized to develop desperately needed infrastructure, or reduce the tax burden on Canadian citizens. If the present folly continues, Canada will be bankrupt.